Ironically, the first post I find myself writing in 2012 is actually about the last meal I cooked up in 2011. For a few years running now, I’ve continued to boycott eating out on New Year’s Eve… reallocating the budget towards a bottle of good bubbly for the countdown instead =P. What I find most frustrating is that even the most respectable of restaurants can end up succumbing to serving significantly crapper food for twice the price through shoddy NYE set menus. So a meal in it was again this year. It’s been a while since I cooked up Lamb shanks as I find they aren’t always available behind the meat counter at my local Waitrose. When you can get your hands on them though, it’s one of those cuts that gives so much bang for buck. 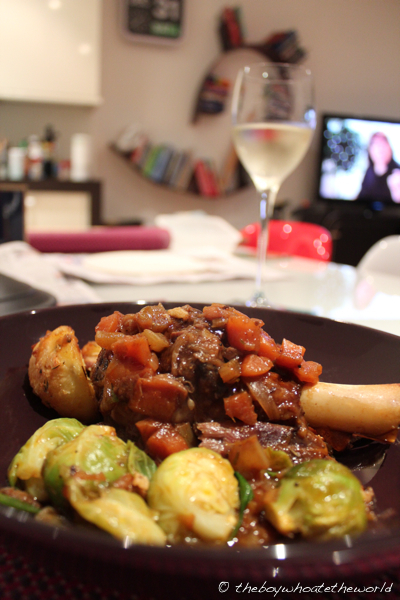 At less than £7 a kilogram, a couple shanks will only set you back a fiver… yet, it still amazes me how much flavour the shanks can impart to a little bit of red-wine, stock and sofrito vegetables when you let the oven work it’s magic for 2-3 hours. The addition of sweet, spicy Harissa and Ras El Hanout spices (which you can get off the shelf from most supermarkets) was purely experimental… but it worked wonders, giving the dish a Moroccan twist and a depth of flavour like no other. Give it a go! Mix together the spice rub ingredients in a small bowl, then rub all over the lamb shanks. Put aside for 10-15 minutes (use this time to chop up the carrots, celery and onions and pre-heat the oven to 150°C). Heat up an oven-proof casserole pot on the stove to a high heat. Add a tablespoon of oil and brown the lamb shanks on all sides for 2-3 minutes. Once browned, remove and set aside. I used my cast iron pot for this as I find all the cooking (be it on the stove or in the oven) can be done in one dish which saves on washing up. If you don’t have an oven-proof pot, you can do the initial cooking in a normal pan and transfer the ingredients to an oven-proof dish later. In the same pot you browned the shanks in, add a little bit more oil and saute the carrots, celery and onions for 4-5 minutes on a medium to high-heat. Add the Harissa paste and Tomato puree and cook with the vegetables for a further 2-3 minutes. Put into the oven and slow-cook for 2.5 hours until the meat falls off the bone. Peek every hour or so to make sure the liquid doesn’t reduce to the point of burning (even if you’re using a heavy lid, water still does escape…), adding a little bit of hot water to loosen up the sauce up as needed. Serve with mash or simply boiled potatoes and some greens. Enjoy!